Follow the color chart to brick stitch a pair of 3-D Lily Earrings with crystal accented dangles, a lovely symbol of spring. The graceful shape of these lily blooms will enhance any spring outfit. 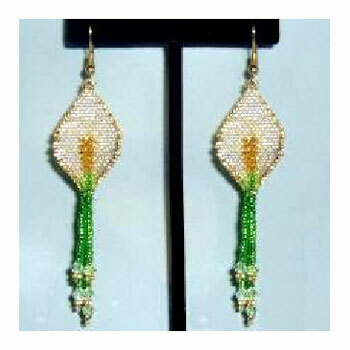 Brick-stitched with 3-D accents in size 15 seed beads the pair measure 3/4" wide by 3" long including the darling crystal and seed bead fringe dangles.